I've been trying to figure out how to paint the wings over the last week or so, and I've come up with what I hope will be a great way to do them. Right now there is a small RTV rubber mold in the basement with liquid acrylic resin cooling and hardening in it. 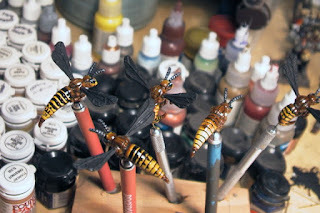 If the mold works, I'll have clear plastic wings for my hornets when I crack it open tomorrow. Basically, these blew me away this morning and the whole idea of clear wings is fantastic. Get the feeling I like these?